They’re not bad thought-starters; however meaningful these motivational sayings were at creation their recent ubiquity has made them cliché and no longer powerful. Candy Chang is an artist, designer, and urban planner who explores making cities more contemplative through the creative use of their public spaces. When Candy lost someone close to her, introspection, in symbiosis with her passion for public places, yielded the “before I die” project. She turned the side of an abandoned building in her native New Orleans into a giant chalk board with the header, “Before I die, I want to…” She repeated the phrase in many blank grids on the wall, and made pieces of chalk readily available. Candy hoped people would fill in some of the blanks. By the next day, the wall was entirely filled out. "Before I die, I want to be tried for piracy." "Before I die, I want to straddle the International Date Line." "Before I die, I want to sing for millions." "Before I die, I want to plant a tree." "Before I die, I want to live off the grid." "Before I die, I want to hold her one more time." "Before I die, I want to be someone's cavalry." "Before I die, I want to be completely myself." 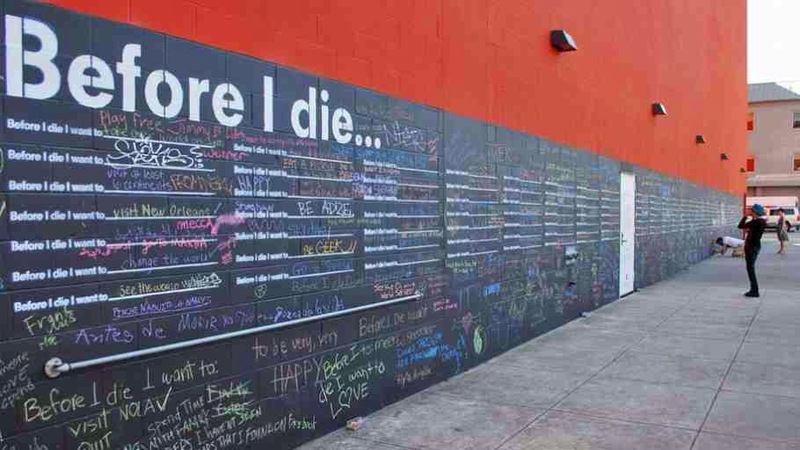 The project has now expanded, not only in New Orleans, but also in public spaces globally, with “before I die…” walls in China, France, South Africa, and many other locations. Ms. Chang created a public, interactive, inspirational experience from, what could have been, another riff on the “take control of your life” cliché. 2014 marketing data is showing that consumers prefer spending money on experiences over acquisitions, and prefer social networks over traditional "passive" media. One powerful “take-away” from 2014 is to focus on audience, or customer, experience over the traditional presentation of information, product or service -- persuasion trumps communication. The concept is not new; in fact it is in danger of being cliché. Engage your customers, don't just speak to them. The inspiration is to create novel and effective execution of this concept. Before I die, I want to turn cliché into inspiration. How about you; what do you want to do before you die?